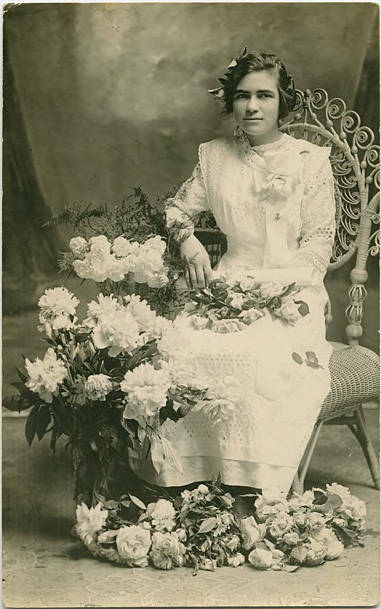 Black and white portrait of a young woman wearing a white dress. She is seated in a wicker chair and holds a rolled up document and a bouquet of roses in her lap. Her long-sleeved dress is almost entirely overlaid with eyelet material, and she wears a large corsage on her chest. Several bouquets stand beside her and flowers are gathered at her feet. Her short hair is curled and combed softly back from her face. Though the back of the card reads 'Mrs. Morrissey,' it is more likely that the photo is that of one of the Morrisseys' daughters. 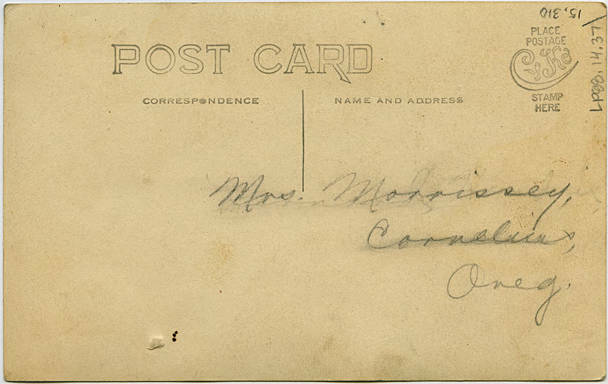 [back] [pen] Mrs. Morrissey, Cornelius, Oreg.